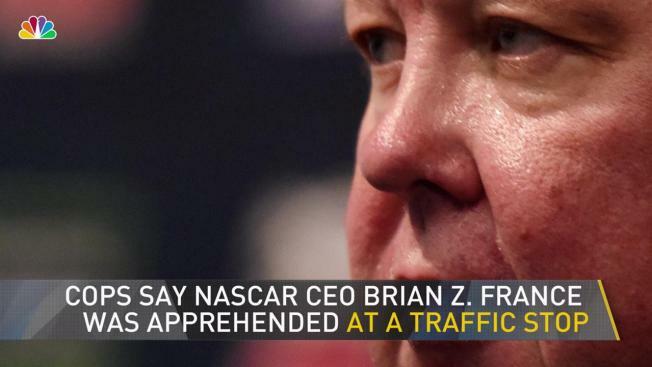 NASCAR says it takes France's arrest "as a serious matter and will issue a statement after we have all of the facts"
The CEO of NASCAR is facing charges for allegedly driving while intoxicated on Long Island, and for having illegal drugs in his possession, officials said Monday. Sag Harbor Village Police Department arrested Brian Z. France around 7 p.m. Sunday after officers allegedly observed him driving a 2017 Lexus northbound on Main Street and failing to stop at a stop sign. According to authorities, upon a traffic stop, officers determined that France was allegedly driving drunk. They also say he was in possession of oxycodone pills. France is charged with aggravated DWI and criminal possession of a controlled substance in the seventh degree. He was arraigned Monday morning in Sag Harbor and was released on his own recognizance. Information on an attorney for him wasn't immediately available. On Monday, France issued a statement apologizing for the incident. “I apologize to our fans, our industry and my family for the impact of my actions last night. Effective immediately, I will be taking an indefinite leave of absence from my position to focus on my personal affairs,” he said. Additionally, in a subsequent statement afternoon, NASCAR futher said: "Brian France has taken an indefinite leave of absence from NASCAR as chairman and chief executive officer. Effective immediately, NASCAR Vice Chairman and Executive Vice President Jim France has assumed the role of interim chairman and chief executive officer."